Have you recently decorated a home with Resene paints? If so, you could be a winner. 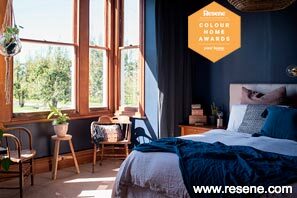 Resene and Your Home & Garden are on the lookout for the most stunning interior or exterior colour scheme created with Resene paints to be featured in Your Home & Garden magazine. Monthly winners win $250 of Resene paint vouchers and the grand winner $5000 cash! Entries have now closed. Check back in winter 2019 for our next competition. View previous winning entries below. You will need Acrobat Reader if you would like to view the PDF downloads available via the stories below. The vibrant hues of the Mediterranean inspired this homeowner to break out the brights in her back garden. This New Plymouth kitset home has been perfectly personalised with a calm, relaxing colour palette in the bedroom and bathroom. A little colour goes a long way, as this family found when renovating their 1960s Hawke’s Bay home.